Discover the amazing benefits of AkuC today! AkuC is a high quality antioxidant and a good source of vitamin C.
When used regularly, it contributes to the maintenance of good health and helps prevent vitamin C deficiency. AkuC helps the body to metabolize fats and proteins. AkuC promotes the healing of wounds. AkuC helps in the development and maintenance of bones, cartilage, teeth and gums. AkuC helps in the formation of connective tissue. AkuC is an antioxidant and a factor in the maintenance of good health. 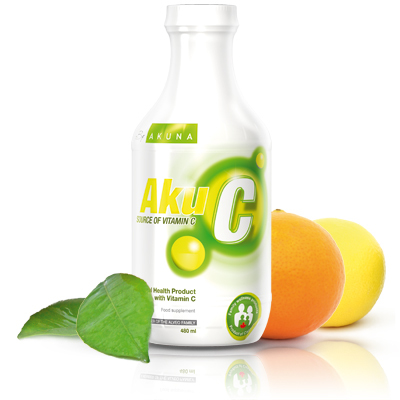 AkuC helps to prevent vitamin C deficiency. The recommended daily use for adults is ½ fl. oz or 15 ml. with food. Please consult your health care practitioner for the use in children. We have all heard at some point or another that minerals are important to our health. However, not all of us are sure of why this is the case. This lack of information may be a factor why an estimated 90% of North Americans suffer from a mineral deficiency or imbalance. Thanks to the extensive research conducted regarding the relationship between minerals and our health, it has become evident that sustaining a balanced level of minerals in every organ, tissue and cell of the human body may be prominent key to maintaining a healthy existence. Unfortunately in today’s world, naturally occurring, nutrient-rich foods are becoming a thing of the past. Fortunately, thanks to all this research and development, we can turn to nutritional supplements to support our health. We tend to hear a lot about minerals such as calcium and magnesium but are often not familiar with the importance of some of these minerals which our bodies also require. Trace minerals or trace elements are generally, uncommon minerals that practically all organisms need in minute quantities in order to trigger the production of enzymes and hormones for growth, reproduction and health maintenance of the animal or plant body. Nutritionally speaking, trace minerals by definition are those which are required by the human body in micro amount, i.e. in 100 milligrams (mg) dosages per day, or less. Below is a closer look at three trace minerals, their function and their importance to the human body. The natural importance of manganese was discovered in 1936-37, when researches reported the development of bony malformation in poultry fed on a manganese-free diet. Later studies also demonstrated the relationship of manganese to growth, bone development, reproduction, and the functioning of the central nervous system. Manganese is an essential trace nutrient in all forms of life. The human body contains about 10 to 20 mg of manganese, which is widely distributed throughout the tissues, stored mainly in liver and kidneys. It plays an important role in a number of physiological processes as a constituent of some enzymes and an activator of their enzymes which are involved in the metabolism of carbohydrates, fats, and proteins. In combination with choline, it helps in the digestion and utilization of fat. Manganese helps to nourish the nerves and brain and assist in the proper coordinative action between the brain, nerves and muscles in every part of the body. It is also involved in normal reproduction and function of mammary glands. On the other hand, manganese deficiency has been observed in a number of animal species. Signs of manganese deficiency include impaired growth, impaired reproductive function, skeletal abnormalities, impaired glucose tolerance, and altered carbohydrate and lipid metabolism. In humans, demonstration of a manganese deficiency syndrome has been less clear. A child on long-term total parenteral nutrition (fed intravenously) lacking manganese developed bone demineralization and impaired growth that were corrected by manganese supplementation. However, the human body obtains sufficient manganese through normal dietary intake, so a deficiency syndrome is rare. It has been documented that women with osteoporosis have increased plasma levels of manganese and also an enhanced plasma response to an oral dose of manganese. Estimated average dietary manganese intakes range from 2.1 – 2.3 mg/day for men and 1.6 – 1.8 mg/day for women. People eating vegetarian diets and western diets emphasizing whole grains may have manganese include whole grains, nuts, leafy vegetables, and teas. Foods high in phytic acid, such as beans, seeds, nuts, whole grains, and soy products, or foods high in oxalic acid, such as cabbage, spinach, and sweet potatoes, may slightly inhibit manganese absorption. 1. Do not eat until you are genuinely hungry. When you are hungry our stomach will tell us that it needs food. This means the stomach is empty from the previous meal and is ready to digest a new meal. If you eat when you are not hungry or continually eat and mix semi digested foods with new ones, it will cause the mixture to stay in the stomach pouch for a longer time. This causes purification and fermentation of foods leading to health problems. 2. Do not over eat. The stomach has a limited capacity for food and needs some space for mixing and digestion. If it is completely full, it cannot function properly. The stomach is located beneath heart, and when the stomach is full it expands and applies pressure on the heart. The process leaves very little space for the heart to beat at its proper pace. Too much pressure can cause the heart to palpitate or to beat at irregular intervals. Always stop eating before you feel full. It takes approximately 20 minutes for the stomach to let your brains know you are in fact full and that it is best at that time to stop eating. 3. Take liquids before solids. Foods that are less difficult to digest and require less time should be eaten first. After the easier swallow food has been consumed, start with harder to chew foods that need more time for digestion. The food, which is more solid and has the lower water content, should be taken after the food, which has highest water content. Soup and vegetables should be taken before the main meal. 4. Do not drink while you are eating. Water, juices or carbonated drinks should not be taken with a meal as they dilute the stomach juices and enzymes and interrupt digestion process. This causes gas, bloating, pain, constipation and toxicity of the whole body. Undigested food goes into the intestines and then into the colon where it putrefies and ferments to create more gas and acid, which is then re-absorbed, into the bloodstream. Water and all kinds of drinks can be taken half an hour before and about two hours after the meal. 5. It is best to chew each bite of food 20-30 times. Chewing food is a very important process in proper digestion. Dieticians recommended chewing solid food to the extent. This ensures for proper breakdown and causes the food to change to the more liquid for before making for a more simple digestion process. Many problems and diseases are caused by not chewing food adequately. 6. Do not mix different food groups together and try to eat a single food group at one time. There are different groups of food in nature, for instance fats, proteins, and carbohydrates. Most of the food we consume is complex, but in order to have better digestion it is best not mix proteins with carbohydrates or fats with proteins. For example, the traditional North American dish of steak and potatoes in not a good mixture for healthy digestion and nutrients absorption. If a potato, which is carbohydrate, gets served with vegetables it makes an ideal food combination. Carbohydrates and vegetables also make a good combination. A proper combination of the right foods makes for over all healthy digestion. 7. Do not eat any processed or manufactured foods. Any food that has been altered by the process using heat or the adding of chemicals to preserve or add flavor or is vitamin enriched is not healthy to eat. For example, white bread does not have any food value left in it nor do cold cuts which are full of chemicals and coloring. All added chemicals are hazardous to your health. 8. Add lots of fiber to your meals. The human digestive system is a long tube which should be filled with a large amount of fibrous foods. Fiber absorbs water and cleans the digestive track. A lack of fibers in your diet causes many kinds of disorders and diseases; from constipation to cancer. 9. Drink at least eight glasses of water a day. Our body is made up of 65% to 70% of water. Without an adequate amount of water, the body does not function optimally and there is a general lack of energy and concentration. All nutrients and vitamins must be dissolved in water in order to be absorbed into the bloodstream. The amount of water to be drink is based on the body weight of the individual; for each kilogram of weight, one ounce of water is needed. Note that too much water is also not recommended as it flushes the nutrients out of your body. 10. Exercise. Exercising makes the muscles strong and keeps the bones dense. It stimulates the lymphatic system keeping the fluids moving so it works better at keeping us healthy. Our lymphatic system is responsible for waste collection and immunity protection. It does not have a pumping system like our bloodstream has to the heart; therefore, the speed of fluid movement is very low. Regular exercise keeps the continual appellation of toxins through the lymphatic system removing them from the body. A natural stimulant, cayenne seemingly aids circulatory function by feeding the necessary elements info the cell structure of the arteries, veins, and capillaries so that these regain some of the elasticity of youth, allowing the blood pressure to adjust itself to normal. It also simulates the digestive system, and it has been used for treatment against stomachaches, cramps, gas, indigestion, loss of appetite, diarrhea and various fevers. Rich in carotenoids and vitamins C and E: these antioxidants are thought to protect against free radicals and reduce the risk of cancer. Cayenne also appears to be useful in enhancing the activity of various immune systems. Capsaicin, the active ingredient in cayenne, seems to be able to deaden painsensing nerves, even when the cause remains present. Long coveted as a healing aid for stomach upset, heartburn and gas, chronic diarrhea, rheumatism, kidney ailments and abdominal pain cinnamon has been used by homeopathic medical practitioners for diarrhea, hemorrhage and cancerous tumors. For years Asians have promoted its use against heart problems, dental pain and urinary problems, believing that can kill certain bacteria and fungi, improve digestion and help to regulate blood sugar. Said to fortify the immune system, cinnamon has been used to stimulate the respiratory and circulatory system, alleviating bronchial coughs, relieve menstrual discomfort and calm the central nervous system. One of the oldest medical plants; fennel have reportedly been in use for over 4,000 years. Alleged to stimulate the movement of food through the stomach and intestines, it is useful as a digestive aid, and seems to remedy mild spasms in the stomach and intestines, a feeling of fullness, and intestinal and gastric distress. It also claims to have a calming effect on bronchitis and is a superb remedy for coughs and stubborn mucus. In Asian medicine, fennel is recommended for instances of anemia, bloating, heartburn, vomiting, diarrhea, hernia, and skin diseases. This herb has been known and honored in Asia for centuries as a tonic for kidney and liver functions and it is believed to be a natural antioxidant and free-radical scavenger. It has been shown that it has the ability to strengthen tendons, ligaments, bones, the lower back, and the knees. It also has been reported to prevent premature aging, as well as being beneficial in decreasing blood sugar levels in diabetics, and can act as a natural diuretic. High cholesterol, heart conditions, poor circulation, insomnia and chronic bronchitis are among all the conditions that Fo-Ti alleges to help. Providing strength, resilience and stamina. Fo-Ti is usually recommended as a superior herb for athletes, offering increased energy while rejuvenating the body and acting as a natural anti-inflammatory. Ginkgo biloba is the most powerful antioxidant known today and as such is said to help prevent degenerative conditions of the heart, arteries, eyes, ears and other organs, as well as shielding the brain from the effect of stress, toxins and aging. For hundreds of years, traditional Chinese physicians have used ginkgo biloba to treat impotence. It is thought that ginkgolides act by reducing inflammation around small airways in the lungs, and in doing so can offer some aid to asthma and allergy sufferers. Ginkgo biloba is the most broad-spectrum medicine that is known today. It contains so many different active ingredients that no single one of them can account for all of the extract’s healing powers. Instead, they act synergistically – creating an overall effect that is greater than the sum of all of its parts. Rich in vitamins A, B, E, G, and K as well as magnesium, Gotu Kola has long been helpful in the treatment of asthma, bronchitis, heart problems, dysentery, insomnia, eye conditions, exhaustion, inflammation, high blood pressure, diarrhea and problems with urination. Often referred to as, “food for the brain”, taken on a regular basis, this herb has become known as the “key to longevity” in humans, and seems to be able to enhance intelligence and improve memory, increasing mental and physical power, combining stress and improving the reflexes. Gotu kola nourishes the nervous system, especially the brain, boosting energy levels, helping to fight depression, and reducing sleep disorders. Contemporary Western herbalist have long cited the wound-healing actions of Gotu kola. Guarana figures prominently in the social and medicinal culture of the Amazonian Indians. The seed of guarana has for hundred of years been uses as a general tonic and treatments for many ailments. It holds fast to the claim that it has stimulating effect on the body, as well as having the ability to dispel pain. Guarana has also developed the reputation of being somewhat of an aphrodisiac. South Americans reportedly have used guarana to treat a long list of ailments such as: chronic or infectious diarrhea, headaches (including migraine), pain associated with rheumatism or menstruation, water retention (using as diuretic or “water pill”) and hence as an aid in weight loss, fever, malaria, heat stress and many other ailments. In a Wall Street Journal article (October 16, 2007), Betsy McKay writes that some studies have linked the consumption of cola, the most popular soft drink, and poor bone-mineral density”. A 1994 study based on 127 teenagers published in the Journal of Adolescent Health, and a 2000 study based on 460 high school students published in the Archives of Pediatric and Adolescent Medicine, both showed a connection “between consumption and bone fractures in physically active teen girls. The American Journal of Clinical Nutrition published a Tufts University study, which reported to have “measured bone density and analyzed eating habits” and which found a “significant impact on women who drank more than three colas a week”. On the other hand, the researches in this study, which was funded by the US Department of Agriculture and the National Institute of Health, also showed “no evidence” that bone tissue is harmed by the “occasional” cola. Taking all this research into account, the bottom line is best summarized by Katherine Tucker, an epidemiologist at Tuft University’s USDA Nutrition and the lead author of the cola study. Tucker has simplified by stating “the more cola that women drank, the lower their bone mineral density was”. While so many studies have found a correlation between cola consumption and weak bone density, scientists cannot agree on why this is the case. Some argue that the caffeine, sugar, phosphoric acid and carbonation in cola impair calcium absorption in the bones. One can take into consideration the sugar-factor alone; an average can of soda contains about ¼ cup of sugar! Another reason cola is the culprit is due to its effect on insulin levels, which is augmented by the fact that sugar (along with caffeine) drains the body of B vitamins, magnesium and zinc. Based on recent studies, certain B vitamins are thought to promote stronger bones by lowering homocysteine (an amino acid) levels, which would otherwise impair collagen’s ability to hold bones together. Magnesium plays a role in calcium metabolism and zinc aids with collagen formation. Together, the interruption of these functions sets the stage which results in the reduction of bone health. Smoking and excessive alcohol increases the risk of developing the disease. How can you reduce the chances of osteoporosis? Akuna offers a comprehensive, preventive approach to health aging for men and women – see which products are right for you. What does all this have to do with inflammation? Blood sugar is controlled in a very narrow range. Extra sugar molecules attach to a variety of proteins that in turn injure the blood vessel walls. This is what I refer to as repeated injury to the blood vessel wall and this is what leads to inflammation. When you “spike” your blood sugar level several times a day, every day, it is exactly like taking sandpaper and sanding down the walls of your delicate blood vessels. But for now, let’s go back to the sweet roll: That innocent looking goody not only contains sugars, it is also baked in one of many omega-6 oils such as soybean. Chips and fries are also soaked in soybean oil; processed foods are manufactured with omega-6 oils for longer shelf life. While omega-6s are essential to the human body as they are part of every cell membrane, controlling what goes in and out of the cell — they must be present in direct correlation and balance to the omega-3s. If this balance shifts due to excess consumption of omega-6s, the cell membrane produces chemicals called cytokines that directly cause inflammation. Today’s mainstream western diet has produced an extreme imbalance of these two fats. The ratio of imbalance ranges from 15:1 to as high as 30:1 in favor of the omega-6s. That’s a tremendous amount of cytokines causing inflammation. In today’s food environment, a 3:1 ratio would be optimal and healthy. To make matters worse, the excess weight you acquire from eating these foods creates an overload of fat cells that in turn produce large quantities of pro-inflammatory chemicals adding to the injury which your body is already enduring. The process that began with what seemed as an innocent sweet roll turns into a vicious cycle which over time creates heart disease, high blood pressure, diabetes and finally, as the inflammatory process continues unabated – Alzheimer disease. Who would willfully expose him/herself repeatedly to harmful foods and other substances that are known to cause injury to our bodies? Only smokers perhaps, but they made their choice willfully. The rest of us are simply following the mainstream dietary recommendations and consuming foods that are low in fat and high in polyunsaturated fats and carbohydrates, completely oblivious to the fact that we are indeed causing repeated injury to our blood vessels. It is this repeated injury that creates the chronic inflammation leading to heart disease, stroke, diabetes and obesity. Let me repeat that: the injury, and subsequently, the inflammation in our blood vessels are caused by the low fat diet that has been recommended for years by mainstream medicine. Choose complex carbohydrates such as colorful fruits and vegetables. Eliminate or at least cut down on the inflammation-causing omega-6 fats like corn and soybean oil and the processed foods that are made from them. Animal fats contain less than 20% omega-6s and are much less likely to cause inflammation than the supposedly “healthy polyunsaturated oils”. The belief that saturated fat alone causes heart disease is just that: a belief and not a fact. Actually the belief that saturated fat raises blood cholesterol at all is fairly weak itself. Today, we now know that cholesterol is not the cause of heart disease, and therefore any concern about saturated fats simply sounds absurd. As absurd as the fact that the whole cholesterol theory led to the no-fat/low-fat recommendations that in turn created the very foods which are currently causing the epidemic of inflammation. We are now facing an epidemic of arterial inflammation leading to heart disease and other silent killers. Choose the wholesome foods your grandmother served and not those of your mother which came from grocery shelves filled with manufactured and processed foods. By eliminating inflammatory foods and adding essential nutrients from fresh unprocessed food to your diet, you can reverse the damage caused to your arteries and your body. Choose AKUNA products to help eliminate and prevent inflammation and future disease and use them daily. The ingredients in all Akuna products are natural; this means that our bodies can digest them in the correct physiological forms and many of the ingredients are also well known for their ability to eliminate toxins from the body. In my naturopathic practice I have had unparalleled results with the Akuna products therefore I recommend regular use of Alveo and Take Plaster at the least. However, if you have access to other Akuna products such as Onyx Plus, MasterVit, Pinky or Cleanse Plus, I also recommend the regular use of those. Improve the quality of life for your children as well by improving their diets. There is no escaping the fact that as we continue consuming prepared and processed foods, the more we expose ourselves to the risk and dangers of inflammation. The human body cannot process, nor was it ever designed to process foods packed with sugars and soaked in omega-6 oils. There is but one answer to quieting inflammation, and that is to return to consuming food close to its natural state.